Image of the SEO Periodic Table from SearchEngineLand.com gives you an overview of SEO principals and practices. Do you have a well designed website but you struggle to get people to come? The old adage, “Build it and they will come.” doesn’t apply so much to the internet like it does in the brick and mortar world. With almost 4 billion websites competing for the attention of the internet’s patrons, you have to compete for visitors to achieve success with your website. Armed with knowledge of what exactly SEO is and how you can use it to optimize your site’s content will help you get visitors, and the right ones at that, coming to your site in droves. Join us to learn what things you can control and improve your rank with the Search Engines. You have no doubt heard much about SEO, or Search Engine Optimization, and you probably know it is important for your website. But is it something you can do yourself, or do you need to hire someone to do it for you? The answer depends on your comfort level with working on your website and understanding the basic principles of SEO. In this class you will be introduced to the main concepts of SEO so you understand the big picture of what it is all about. You have heard Content is King, and that really is the basic premise. You just need to learn what you can do to create great content as well as a great user experience for your customers and how to communicate what your site is all about to the search engines. This class will help you improve your rank by showing you how to optimize your content and communicate to Google and Bing what your site is all about. Direct Navigation: Typed in traffic, bookmarks, email links without tracking codes, etc. The Beginner’s Guide to Search Engine Optimization (SEO) is an in-depth tutorial on how search engines work. This guide covers the fundamental strategies that make your websites search engine–friendly. Download your copy of the world’s most-read guide on SEO! Yoast writes about several topics like Content SEO, Technical SEO, UX & Conversion, Analytics, eCommerce, Social Media and, of course, WordPress. Don’t know where to start? 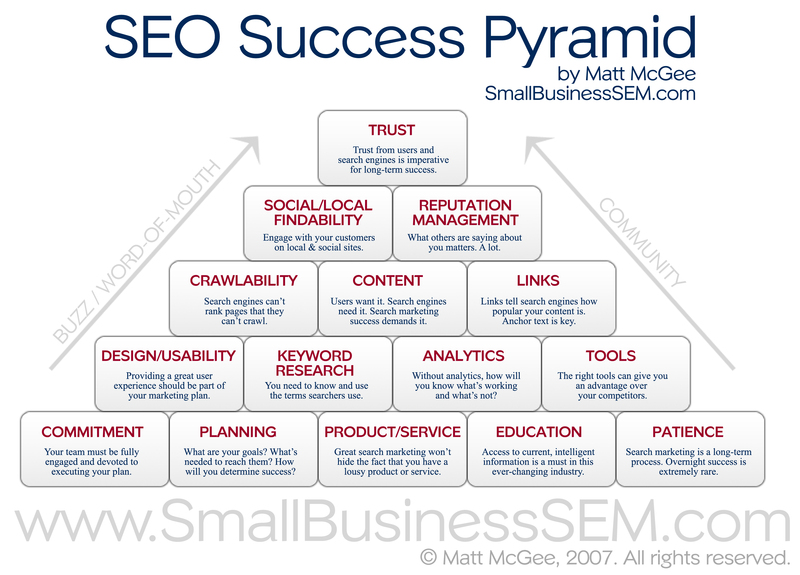 Start with our SEO basics posts or our most essential publications. Get insight into content ideas based on keywords. Knowing how to analyze your SEO competition is an important step in determining your overall keyword and SEO strategy. There are many factors involved in the process, and without the correct framework, it can get complicated. This SEO Competitor Analysis Template will guide you through the exact steps you need to take in order to deploy a comprehensive analysis. Below the infographic, you can find a detailed explanation of each step. The best SEOs don’t talk to their clients about rankings; they talk about the process of making great web sites that earn traffic and convert visitors into customers. They talk about the process of creating great content that attracts links like bees to honey. This document first began as an effort to help teams within Google, but we thought it’d be just as useful to webmasters that are new to the topic of search engine optimization and wish to improve their sites’ interaction with both users and search engines. Although this guide won’t tell you any secrets that’ll automatically rank your site first for queries in Google (sorry! ), following the best practices outlined below will make it easier for search engines to crawl, index and understand your content. Free and simple. Suitable when you need to quickly create a sitemap for a small web site (up to 500) pages. In our quest to make 404 pages more useful, we’ve just added a section in Webmaster Tools called “Enhance 404 pages”. If you’ve created a custom 404 page this allows you to embed a widget in your 404 page that helps your visitors find what they’re looking for by providing suggestions based on the incorrect URL. To access Keyword Planner, you must sign in to your AdWords account. If you don’t have an AdWords account, learn how to create one. Bing Webmaster provides easy-to-use public tools to help you do more with your site. Show up when customers search for your business or businesses like yours on Google Search and Maps. Google My Business lets you post updates to showcase what’s new, respond to reviews to build loyalty and add photos to highlight what makes your business special. Develop a High Quality Inbound Link Profile. Research backlinks, find link-building opportunities and discover potentially damaging links with Open Site Explorer. One tool to discover and prioritize the best keywords to target.